Pie and mash cafes were once, a staple part of every high street but sadly they’ve now become a dying breed. I’m a huge fan of conservation and I really feel that East London has a huge identity that it should work hard to keep hold of. Having heard that a new (and halal) pie shop had opened up locally, I couldn’t wait to visit. 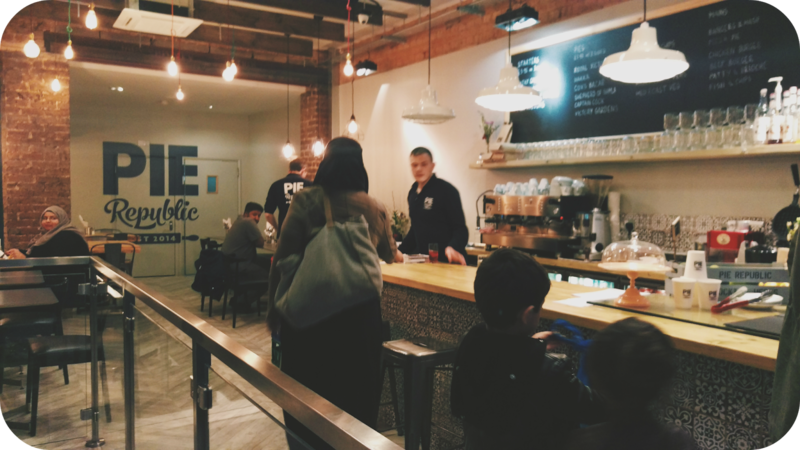 Pie Republic are a brand new restaurant offering hand made comfort grub. I visited with family on a weekday evening, it was fairly busy which is always a good sign. The staff were very friendly and seated us straight away. Since there was a few of us, we were seated downstairs. The tables are a little bit nicer downstairs, as the table tops are made from wooden pallets (upstairs they’re plastic). Overall the decor is cute, they’ve adopted the rustic look that a lot of newer restaurants are going for i.e. exposed brickwork and fancy light bulbs and kept the essence of pie and mash shops; most importantly though the restaurant is clean. 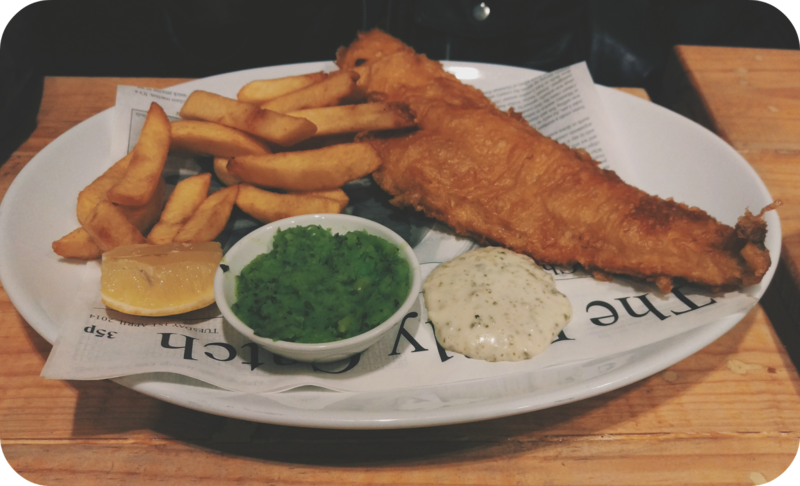 We ordered a range of dishes including the Hakka Pie, Royal Victoria and fish & chips. The food was all delicious. It came out piping hot and we were told that the pies are all made fresh on site. The pie meals come with a small jug of gravy and two sides so we opted for handcut chips, house slaw and roasted veg. All the meat is HMC certified halal so happy days! I had the Royal Victoria and it was absolutely delicious. Well seasoned and the chicken peices weren’t too big. I don’t really eat much red meat but I did try the Hakka and was equally impressed. My only very small gripe was that the chips were not handcut, they were steak chips. They tasted fine though so no real issues. Despite hearing a few horror stories of food running out and ridiculous wait times, our pies were out and on our table in 15 mins. The cutlery is already on the table but there were no condiments. As I looked around, I spotted a small table with vinegar, ketchup and mayo on it but there was only one bottle of each! This might have just been because we were seated downstairs and also, you don;t need very many condiments with pie. All in all, the service and food were both fantastic. 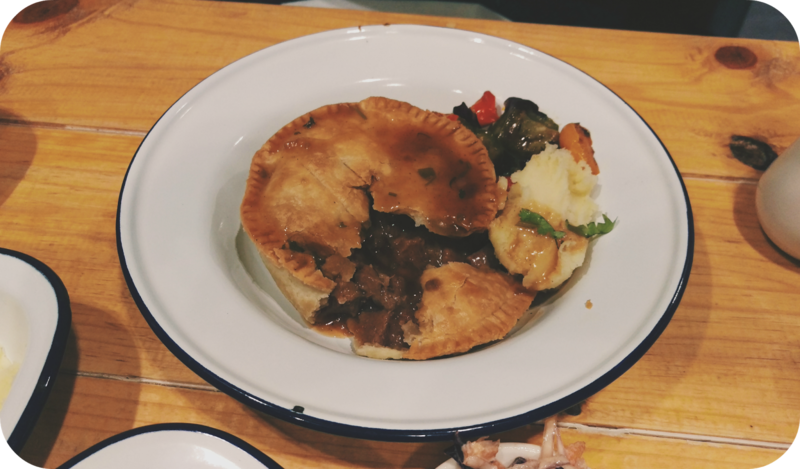 The prices were also really good – £7.98 for a pie and two sides! Where else can you get a good hearty meal for under a tenner these days? Currently Pie Republic only do collection but I’m hoping that they will deliver soon as I’ll definitely be placing regular orders, in the meantime though you can bet your bottom dollar that I’ll be keeping this tradition alive by visiting again very very soon.